For more than twenty years, Denver has been shaking off the once held “cow town” persona with deliberation. Beyond the decades long cultural boom that Denverites have been experiencing– bringing unique architecture and internationally renowned art centers to the Mile High City, this growing metropolis has also benefited from the recent international tech explosion. The Denver branch of the World Trade Center has more than 250 companies and individual members. 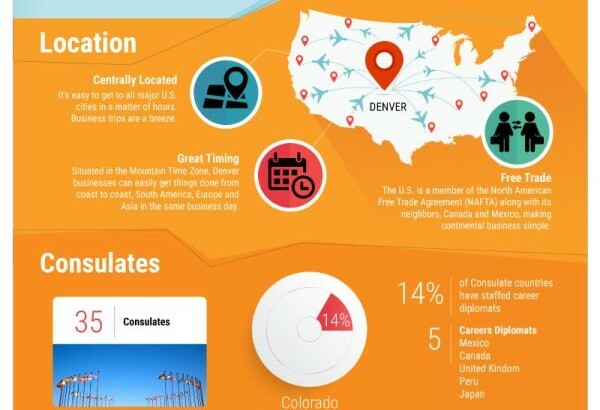 International organizations like Google, IBM, Oracle, MapQuest and Frontier Airlines have long called Denver either home base or used it as a key location. Other, non-tech, albeit important, companies like Quiznos, Chipotle, Western Union and Re/Max grew established operations in Denver and stretched their reach into international territory after remarkable growth. The city is also home to thousands of successful startups. According to a 2013 Forbes article, a new startup launches in Denver every 72 hours. The population of Denver also reflects the international feel of the city. It’s all well and good to have a bunch of homogeneous locals conducting business via Skype with their international branches, but that is not what makes an international culture. In addition to being one of the top ten fastest growing cities in the United States, Denver is becoming more diverse and is doing more to foster a multicultural experience. Denver has a lot going for it in terms of local culture and natural excellence, but the important takeaway from recent growth is the city’s interconnected development. What was once an isolated pit stop on a mining route has now become one of the most popular, international business hubs in the world. And it’s still growing. Learn more about studying Academic English in Denver here.